In a week of fantastic Test cricket filled with high drama and controversy, it was inevitable - given one of those controversies was over someone walking, or not walking - that I was drawn into the debate. That was exacerbated when an idiot who was pretending to be me on Twitter, under a fake account, started to be quoted in newspaper articles as me. To clarify: I have never had a Twitter account and still don't, so any accounts claiming to be me are fake. Despite the fact that I was a walker, I don't judge any player, past or present, who chooses a different approach. However, I believe the Trent Bridge Test focused the light clearly on the Decision Review System, and overall I think the game is poorer for its inclusion. The spontaneity and drama, the magic and intrigue that Test cricket always possessed has been lost. The reality and finality of seeing the umpire's finger raised has been erased, because everyone now looks to the batsman or fielding captain to see their response. Compare the way the Trent Bridge Test ended on Sunday with the memorable scenes at Edgbaston in 2005, when in a similar result Australia fell agonisingly short of the target. Michael Kasprowicz was the last man out, caught behind off Steve Harmison, and if the DRS had been in place, we would probably still be looking at the tape because I don't think anyone really knows even now whether it was out or not. That's fine: I have no problem with the decision that was made. I was part of the Australian team on that occasion and we, and the whole nation, ended up on the losing side in an incredible match. But what a magical finish it was for cricket. There was no possibility of that instant being lost, whereas now those split-second moments and the ensuing few seconds are quite different. The scenes that played out at Trent Bridge won't be remembered in the same way as those from Edgbaston. In my opinion, the game is poorer for that. I don't say that because the decision to give Brad Haddin out caught-behind cost Australia a Test match. I understand the proposed benefits of technology eradicating umpiring errors but this Test match, which was full of wonderful technique and skill and fight, showed quite glaringly that the errors are still occurring. I have always found it a frustration that under the DRS a player can question an umpire's decision. One of the strongest elements of the spirit of any sport is not questioning the umpires or referees. We now have a situation where players can do that, albeit limited times. That doesn't sit comfortably with me. 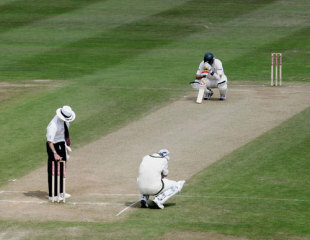 Yes, technology is here, but perhaps a Test match like this has gone a long way to indicate that the umpires need to have full control as to when a decision is reviewed, rather than the players. For the first time, I'm starting to understand India's reluctance to go with the system. It's not a remedy that seems to have cured the problem. In fact, it may even have become more of a problem. Listening to Michael Clarke talk about using his reviews poorly, it has certainly become more of a headache for captains. It was an outstanding Test match, the kind of hard-fought Test I remember watching when I was growing up. But I feel technology took something away from the game, for both the teams and for the spectators. The only sport I've seen where technology has really enhanced the sport - and they're getting it right - is tennis. The review system in tennis is adding to the spectacle and the occasion. It's so quick, and in fact it has probably sped the game up because we don't have players spending time questioning the umpire's call. They just refer it and the decision is made quickly. But those are line decisions, like run-outs in cricket, not catches or lbws. Perhaps cricket's DRS needs to be put on the back-burner until a better system is found. Despite Australia's loss, there is plenty for the team to take from Trent Bridge into this week's Lord's Test. There was strong evidence the players were really united in their effort and were totally committed to doing whatever the team required. Those are good signs. It's going to be very tough, but I think what we saw there was the foundation of a group that has the potential to succeed. It was so refreshing to see Ashton Agar's approach to Test cricket. What spoke volumes, as much as the 98 runs and two wickets and his cool head, was his reaction on getting out: the disappointed smile and then his interaction with his family, apologising to them for not getting a hundred. It was a wonderful and uninhibited approach from a player who doesn't expect anything from the game, and I don't expect that will change just because of the way he played at Trent Bridge. Agar and the rest of the lower half of the order showed that if you watch the ball closely and occupy the crease, there will be runs on offer in this series. There's a position or two in the batting line-up that might come under scrutiny. I think Ed Cowan is the one who will feel the heat the most. But he has just been moved to a new position from anything else he's been asked to do in Test cricket, so one more opportunity at Lord's would allow him to feel he's had a fair crack at No. 3. The top six know they have to step up and be the predominant run scorers and not leave it to the bottom five. The Australians will be gutted but it's a good thing that there is such a quick turnaround between Tests. There has to be a binding effect for a group like that, to know they were so close to achieving success together. I wouldn't expect much change in the team for Lord's. Despite the result, they have built up a nice unit and there is a bit of momentum - a refreshing change from what we have seen recently. Sambit Bal How about demanding honesty from the players?